"Who is that girl?!" -- said to himself as Willow runs off with Buffy before he can speak with her. In Halloween, Oz interacts with Cordelia, who's looking for Devon. An amusing exchange (well, if Oz is talking it's either going to be amusing or sweet, possibly both!) takes place between them, and she storms off in a huff. As Oz is getting ready to walk off, a ghost costume-clad Willow runs into him. But he has no idea it's Willow, and they go their own ways. At the end of the episode, Oz spies Willow striding confidently (wow, I'm thinking of Season 1 Willow...you've come a long way, baby!) across the street and is mesmerized. What's a guy to do but wonder aloud for the 2nd time, "Who is that girl?!" What's My Line Parts 1 & 2 gives Oz the break he's been looking for. He finally finds himself alone in a room with Willow, and offers her a canape. We next see Oz come over to talk to Willow after Buffy leaves. He lets on that he's not too into schoolwork but he tests well. And for him, the great challenge is E-flat diminished ninth. In this episode, Oz also takes a bullet for Willow. When they're looking at his arm (what's with Oz and the arms? See Season 2's Innocence..) we see by Oz's reaction just how unflappable he is. He remarks that he's been shot, and that it's odd...and painful. The end of this episode marks Willow's succumbing to Oz's charms. She thanks him for saving her life, he changes the subject, sneaks in a quick compliment about her smile, and then proceeds to talk about animal crackers. "I mock you with my monkeypants." -- to Willow, on discussing what the monkey (the only cookie animal that gets to wear clothes) must say to all the other animal cookies. Xander: "Yeah, vampires are real, a lot of them live in Sunnydale, Willow'll fill you in." Willow: "I know it's kind of hard to accept at first--"
Oz: "Actually, it explains a lot!" Later in this episode, Oz helps the gang secure some weaponry from an army base, and he and Willow chat more in the van. Willow, feeling hurt from Xander's betrayal, asks Oz if he wants to kiss her. He tells her yes, but he won't do it until she's ready. He can tell that she's trying to use him to make Xander jealous, and he says he can wait. It's at this point that probably all the chicks who saw this show fell in love with Oz....Later still, Oz helps out the gang by figuring out where Dru, Angel, and The Judge have gone in their effort to bring about Armageddon. After The Judge is blown to bits, and the pieces are being collected, Oz stands and points at something, saying, "Uh...arm!". Phases marks an all-out Oz episode. It's in this episode that he discovers he's a werewolf, and he's afraid of how it will impact his relationship with Willow. Ironically, Willow is the one who shoots him with the tranquilizer gun. This couple seems to be into shooting a wee bit much, but since none of it's by choice and is dictated by circumstances beyond their control, I think it's okay! Oz is delighted, surprised, and thrilled to discover that Willow likes him and still wants to be with him. A number of good lines from this episode, with Oz's classic, "A werewolf in love," tying it up neatly. It's 11 episodes since we first met Oz in Inca Mummy Girl and it's very satisfying that not only was Oz able to figure out "Who is that girl? ", but get her as well. Please pardon my warm fuzzies here. Thanks! Bewitched, Bothered & Bewildered marks the first time that Willow calls Oz her boyfriend. We see Oz playing at the Bronze, and then his role is pretty limited in this episode. He serves to help Giles find the Buffyrat, while also demonstrating that it bothers him a lot when Willow's upset. Oz hits Xander in this episode, too. But then he helps him up, so...I'm not gonna fault him. I'm evil, aren't I? Becoming part I barely features Oz. He's in a cafeteria scene, and his chick Willow's sitting on his lap. They're a couple, you know, so they can do that. Until Principal Snyder shows up, that is. That's the only time we see Oz here. "This time, it's personal." -- Oz lends Willow a hand with the slaying quippage a la Buffy. Oz exhibits more classic-ness in DMP. He's still helping the gang slay, and he brings his own brand of wit when he comes into contact with the zombie cat. He says, "I like it," pretty much the same reaction he had to the trophy in Phases. Anyhoo, in this episode, he gets his band to play Buffy's party and he tries to play peacemaker/referee when Xander and Buffy are having "words." Later, he goes to tell Buffy about the whole "go for the eyes" theory so she can vanquish Pat, who's now the Zombie Demon. But..he's a bit late..see quote. "Never mind." -- after seeing Buffy put a shovel to the Zombie's eyes. In FHT, Oz is the first to point out that "..there's a new slayer in town." He also outs himself as a werewolf to Faith, the new slayer. That's pretty much it. AMAB shows the wolfier side of Oz. Although he's wolfed out before, this time he's living with the fear that he may have caused the death of a schoolmate, Jeff Orkin. Oz grapples with this, knowing that it's not easy for his chick Willow to deal with either. He feels pretty helpless. Basically, Oz isn't the killer, demonic Pete was. The cool part is he gets to help kick Pete's sorry demon self, um, yeah. Also noteworthy is his offer to help Debbie out, and I don't just mean by giving her his notes. When Oz notices her black eye, he asks if she wants to talk about it. So, he's concerned musician guy. Cool. In BC, we learn that Oz got the highest score on his SATs last year and the reason we know that is because his chick Willow boasts about it. Oz offers to help Buffy study for the test, too, and he lets us know that the marching band hats "go with everything." Oz does some research with the Scooby Gang, his band plays at the Bronze and he's complimented on his hair by Teen Principal Snyder. Oh yeah, Oz still doesn't know about the kiss. Oz is part of the scenery for a few minutes in Revelations. He expresses a bit of concern about what Angel's being back might mean for all of them. (Unless of course I goofed.) Nothing spectacular, and he still hasn't a clue that Willow and Xander are having a dangerous liaison. In Lovers Walk, we learn that Oz's werewolf senses can kick in..apparently even he wasn't aware of it. He and Cordy are paired to go look for Giles so they can deal with whatever befell Willow and Xander, and they cut down their time considerably when Oz announces that he can smell Willow's fear. He gets a big shock when he sees his chick kissing Xander, and since we saw earlier in the ep. that his sarcastic voice is a lot like his regular voice, it's safe to assume that his hurt/shocked expression kinda mirrors his regular expression. This is quite the blow for unflappable Wolf Boy, I think..especially since he'd given Willow a little Pez witch. On the other hand, maybe all of this will stir something up in Oz -- I don't mean the wolf, okay -- and we can get to witness some different Ozstuff. Hey! Now that I think of it, he hit Xander before and he kinda went haywire on Pete, so..he's got it in him to be unflappable. Or at least expressive. In The Wish, Oz is still reeling from Willow's indiscretion with Xander. He knows that she wants to apologize, but kinda tells her that he needs some time to himself. When the alternate reality is opened, though, Oz is a Slayerette of sorts. Well, there's no Slayer in Sunnydale, but he helps Giles, Nancy, and Larry put down the vamp population in Sunnydale. Been a while since I've seen this ep., but I believe it's Oz who points out the necklace Cordy was wearing, which helps Giles figure out what's what. I'll check and correct soon if need be. Later, Oz rams the Willow vamp into a large wooden thing which dusts her. Talk about revenge! In Amends, Oz makes it clear to Willow that he misses her and wouldn't mind starting up with her again. So he goes over to her house and is quite surprised to be the object of Seduction a la Willow Rosenberg. Oz: "You ever have that dream where you're in a play, and it's the middle of the play, and you really don't know your lines, and you kind of don't know the plot?" -- to Willow, upon entering the Casa d'Amore. Hey, I never took Spanish. And I didn't feel French at the time of this writing, okay? Gingerbread features a good Oz and Xander outing. Here, Oz has to sort of deal with Xander's awkwardness around him 'cause of the whole Willow thing. It makes for some interesting dialogue. Later, Oz is the boyfriend we've -- mostly? for all you dissenters out there -- come to know and love when he takes Willow to Principal Snyder's office after her locker turns up some witchy material. Never one to piss off an angry mob (much), Oz refrains from making any comments to the dudes at City Hall. Not. He and Xander still try to save the gals from being burned at the stake, but they drop from the ceiling a bit too late and find that Cordy and Giles have already arrived. Too funny. Hey. At least he tried. And with Xander, no less! Helpless isn't large in terms of Oz's character. He makes spiffy comments and such once in a while, but that's about it. No ceilings to fall through, no demons for him to bite, and no wolfing out. Bad Girls is so not an Oz episode. In fact, I hardly remember seeing him in this ep. Suffice it to say, no big developments here. Doppelgangland is great in terms of Oz's character. First we learn that he really can't stop himself from hugging Willow when he sees her; we also learn that his band had a gig in Monterey. But better still are his scenes at the Bronze. Sure, the Dingoes are playing but this is really pretty much the first time that he and Angel interact by themselves. When the Bronze is suddenly crawling with vamps, Oz and Angel seem to pretty calmly discuss the need for backup. Angel decides he'll stay rather than get Buffy. But when Oz sees vampWillow, he turns all commanding in a cool way, and orders Angel to "Get Buffy. Do it now." Anyhoo, Oz approaches vampWillow, thinking of course that's it realWillow gone dead, to see what's up and he basically tells her not to hurt anyone. He's confused and kind of hurt I'd say, that she doesn't seem to know who he is, really. She calls him a "white hat" and he's just like, huh? Later, when realWillow enters the Bronze dressed as vampWillow, she gives Oz a little wave, and the look on his face is just great. That knowing smile...very fun to witness. That's pretty much it for him in this episode, but if you didn't get his level of devotion to Willow before, you definitely see it here. You also get to see him kind of freak out internally..and slightly externally. He's not like he was -- i.e., blase, nonchalant, etc. -- when he saw the vamps for the first time in Surprise...here he's visibly more disturbed because the vamp is Willow. Enemies features Oz as Slayerette yet again. This time out, he comes up with a way that the gang can learn more about The Mayor, since Willow tells them that all the computer files have been deleted, and are inaccessible. Oz suggests that they try the town hall, which should have records on him, and he's right...Oz finds an old book showing a picture of Richard Wilkins...so, the gang basically learns that the Mayor's not exactly human...he's lived over 100 years, pretty much. (I'm pretty sure it was Oz who found the book..must check.) Hey, if Oz doesn't want to do college, maybe he can become research assistant extraordinaire...uh...maybe. Earshot info. is on hold until the show airs in September. Choices is a kind of interesting Oz episode, and not just because we get to see him hit something other than Xander. Actually, it's his scene with Xander that's really fun to watch. The two of them have been assigned the task of mixing up the spell goop that will destroy the Box of Gavrok. Oz shows Xander the picture Willow drew of them to help them out, and he points out which stick figure he is...Willow drew a little guitar next to him or something. Later Oz has to witness Willow's being held at daggerpoint by Faith. When Angel starts giving the Mayor some lip, Oz says, "Angel" -- I mean, after all, it's his chick who's going to be gutted like a sea bass if the Mayor gets pissed off, you know? That's pretty much it for him this time out..more devotion to Willow, and some snappy scenes with Xander. The Prom features Oz in a kick tux for the prom. What I dig about this episode in particular is how Oz is way secure in the knowledge that Buffy won't let the gang down...he tells Willow this when she's worried about the hellhound attack during the prom. Basically he does it in his asking-answering way..like, "You think Buffy would let us down?" or something to that effect. 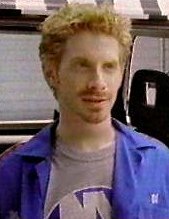 Oz is also instrumental in figuring out who the MOTW (Maladjust of the Week) is...when the gang watches the April Fools videotape of the hellhound attack, he recognizes Tucker Wells from one of his science classes. If Oz voted in the Class Popularity polls, did he pick Jack Mayhew over Xander for class clown? Graduation part I has Oz functioning at Full Slayerette Speed. He and Willow do the research thing, then they do the Panicking Thing....or if you're into the more Biblical-type of euphemism, he "gets to know" Willow. Oz is also the one who discovers that Angel can be cured if he drinks the blood of a slayer. Graduation part II shows Oz doing the watching over Angel thing, taking turns with Willow. Apparently Buffy and Oz look similar..in his delirious state, Angel mistook Oz for Buffy. Heh. What's interesting about this episode is that Oz's van once again plays a pivotal role in the defeat of an uber-monster...in this case, The Mayor. They used the van to load up all those explosive agents, etc. And then I think they might have um, used the van for other purposes...possibly. It's also kind of cool to see Oz taking part in battle, and calling to Xander "in charge" guy to direct the wave of attack. Oz and Xander seem to play off of each other much more comfortably these days...I guess they got past all that "Willow" stuff, etc. Hm. A relationship page for Oz and Xander? "Give me time..."
And finally, it's Oz who makes the astute observation that the gang survived high school...and I'm done. 1. Oz's hair changes color on a regular basis, from brown to light red, to blond. 2. He's a genius...or at least, he tests well. This is good and consistent, as is evidenced in Season 2's WML 2 and again in Season 3's BC. 3. He must have plenty of different vans, one of which is zebra-striped.